In my last post I drew your attention to an interview which my father gave at the initial stages of his career, in this interview he expressed his concern at being typed as a father. 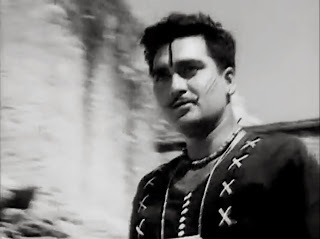 Thanks to the success of Sujata he got flooded with such roles, but thankfully there were some filmmakers who cast him in different kinds of roles, Sunil Dutt was one such filmmaker. When he launched his own banner Ajanta Arts with ' Mujhe Jeene Do'- a film on the dreaded dacoits of the Chambal Valley, he cast my father as his prime adversary the Superintendent of Police (SP). My brother recalls my father talking about a Superintendent of Police by the name of Quinn (I do not know whether that is how his name was spelt for my father mentioned his name and did not spell it, I am assuming that is how it was spelt), this gentleman played an important role in curbing the dacoit menace in the valley. My father's character was loosely based on this person. Incidentally I always knew that the first film under the Ajanta Arts banner was Mujhe Jeene Do (MJD), however while doing a Google search on MJD, I learnt that Yeh Raaste Hain Pyaar Ke (YRHPK) had released earlier. As I have nobody to ask, I can only guess that it is quite likely that while Dutt launched MJD first, YRHPK was probably launched later as a quickie and released earlier. Mujhe Jeene Do for me is a landmark film in the history of Hindi cinema, why do I think so? 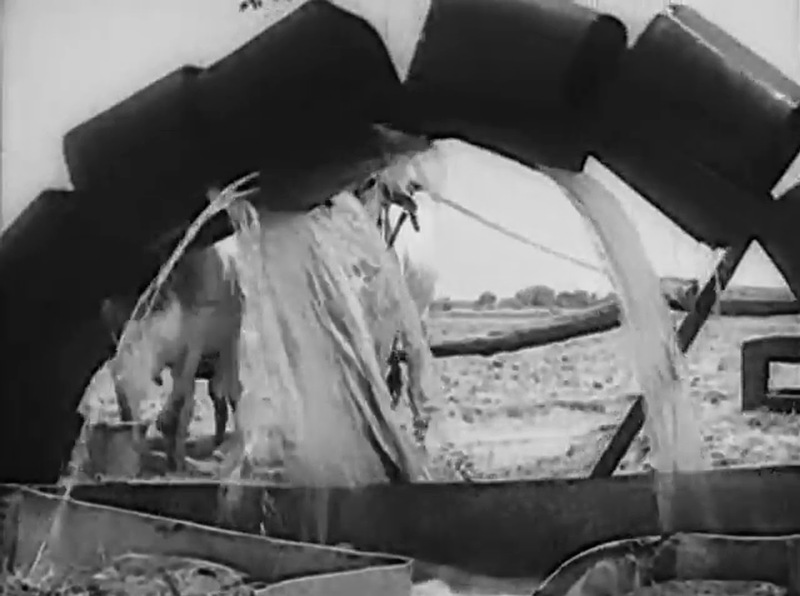 Well there were two films on dacoits that were made earlier, 'Ganga Jamuna' and 'Jis Desh Mein Ganga Behti Hai'. 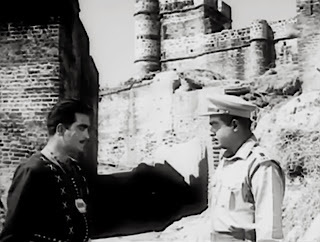 While the former had cruel circumstances driving the hero to become a dacoit, the latter did not have the hero in a dacoit’s role, besides Jis Desh ….. could by no stretch of imagination be called a realistic portrayal of dacoits, but MJD is such a film. 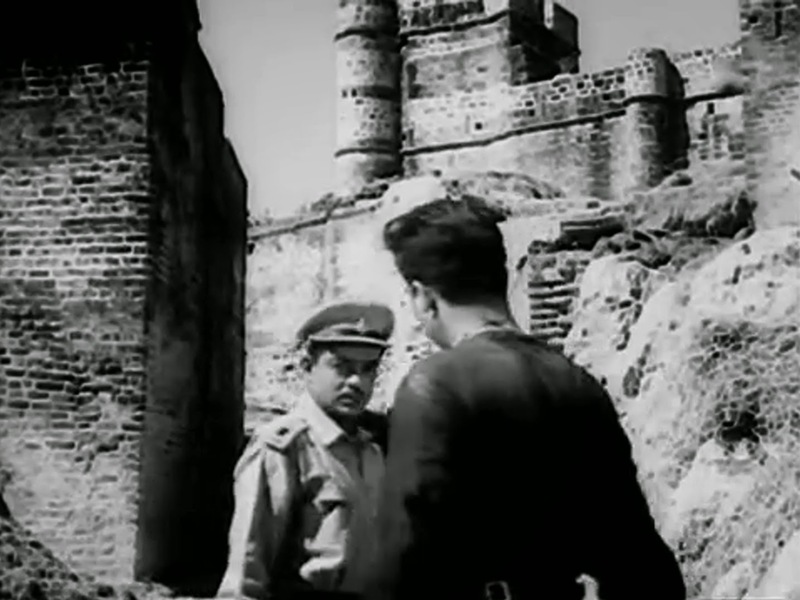 What sets this film apart is that the hero (Sunil Dutt) is shown to be a ruthless dacoit, there is no justification for it. 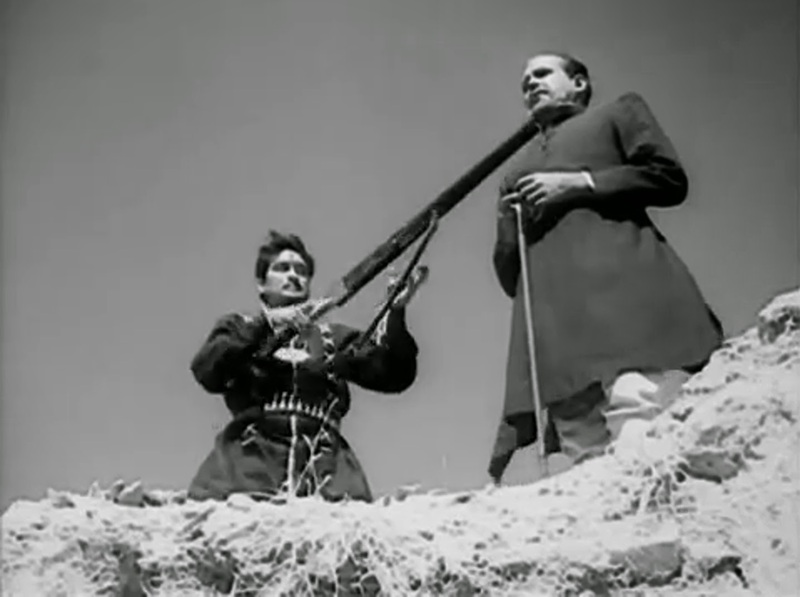 Thakur Jarnail Singh’s (Sunil Dutt) cruelty begins right from the beginning. The police force led by the SP (my father) is on his trail. Along the way he meets the dancer Chameli Bai (Waheeda Rehman) and loses his heart to her. She slowly brings about a change in this ruthless man. The way the film was made and the manner in which each scene has been conceived and shot, I find it difficult to believe that this film is directed by the same director (Moni Bhattacharjee) who directed 'Usne Kaha Tha'. The film tends to drag a bit towards the end, particularly the song tere bachpan ko jawani ki dua, I feel, slows the film down, but then that is a minor problem. 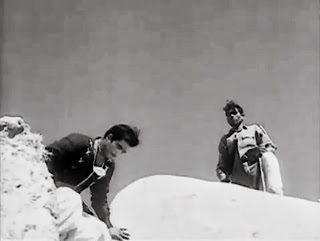 The film grips your attention right from the beginning and what I liked best was the way the director has captured the ravines of the Chambal valley, some of the scenes even remind me of the western films, or cowboy films as we used to call them in our childhood. Those of you who have been following this blog may have noticed that besides talking about my father, I have also been indulging in a bit of film appreciation and MJD is a film where I can go scene by scene and shot by shot. 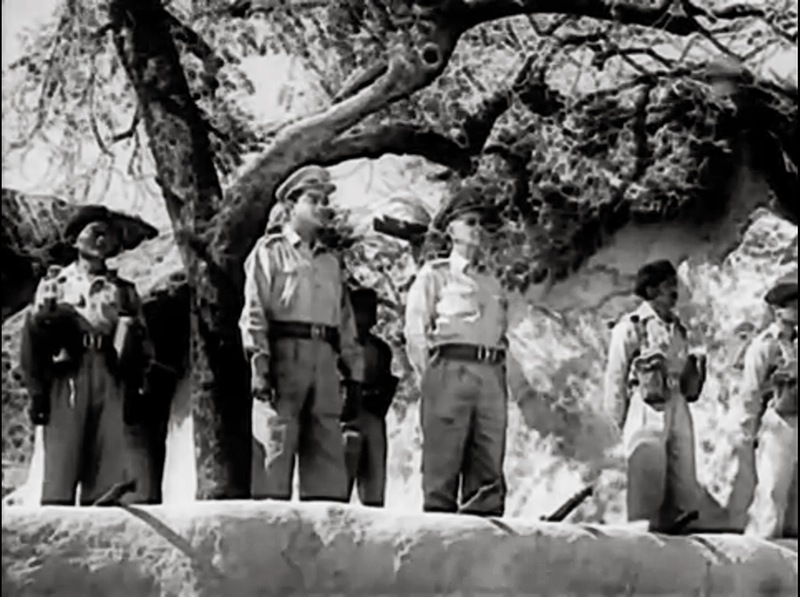 The film opens with a a song celebrating the country’s independence. 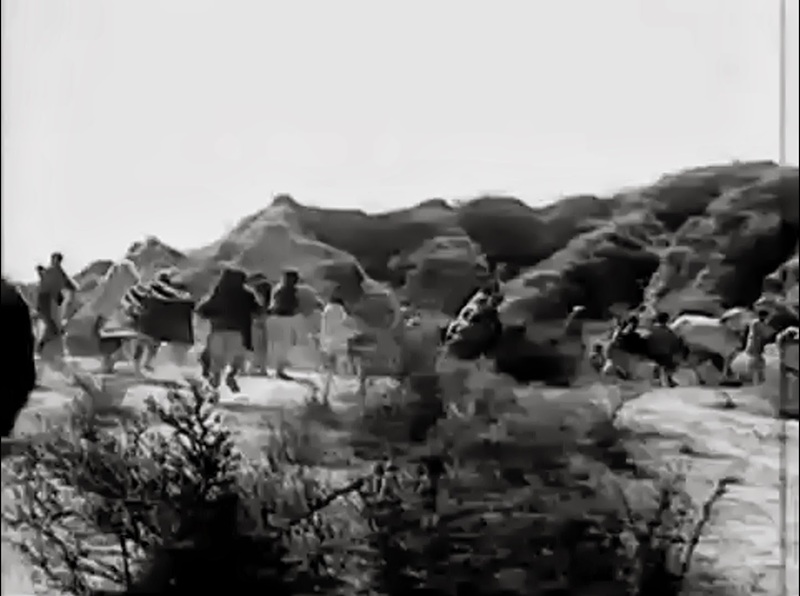 The song’s (ab koi gulshan na ujade ab watan azaad hai) lyrics and visuals highlight the peace and contentment of people living in an independent country. 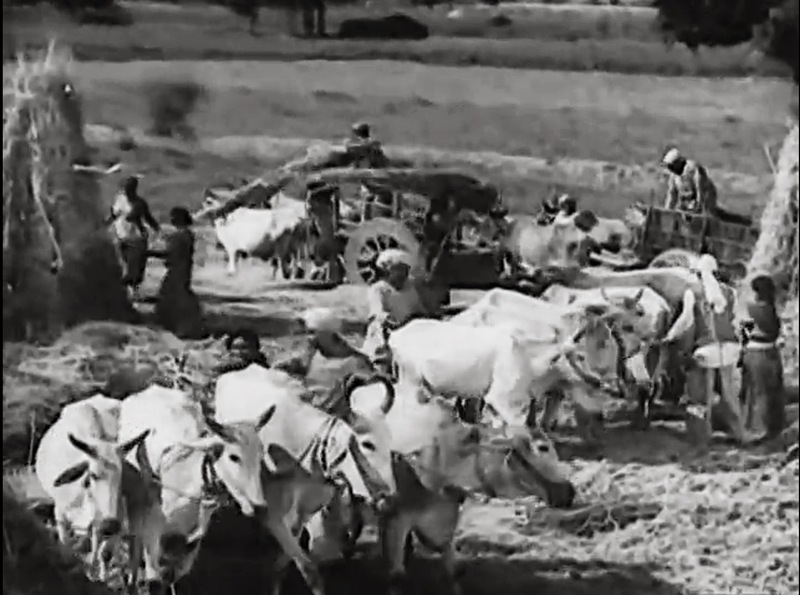 The song primarily focuses on a village with the visuals showing the villagers going about their normal life. 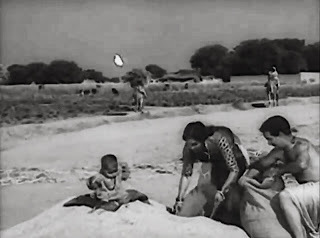 In the screen cap above you see a contented Nirupa Roy working along with her husband and child in the village. But soon the tranquility is shattered as you see the dacoits riding into the village. These scenes have been conceived and shot beautifully. 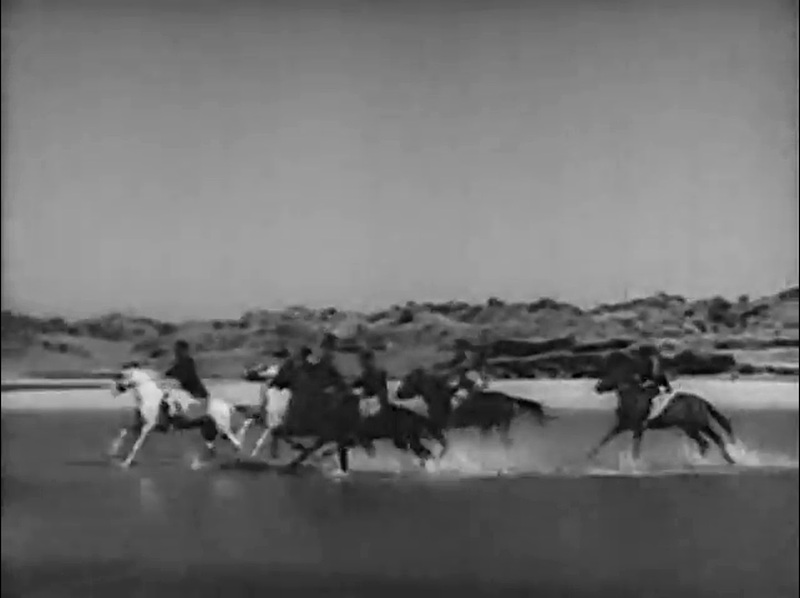 In case of the scenes like the one you see above, usually a Jeep was used to track the movement of the horses, the camera used to be kept in the Jeep. 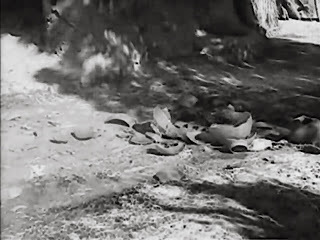 The first sign of impending disaster is indicated by a closeup of a dacoit astride a horse ruthlessly trampling over some pottery, I quite liked this touch for it is a clear indication of the misery to follow. Then Jarnail’s Singh’s cruel character is established. He walks into the home of villager – almost as if he owns it- demanding bullets. 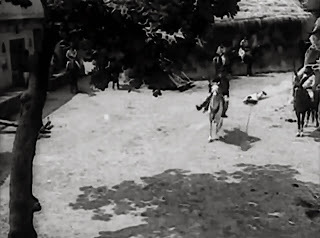 When the villager refuses he ruthlessly shoots him down (above) and mercilessly drags the dying man some distance (below). Although I was quite small when this film was released, there wasone scene that made a major impact on my mind. When I grew up and saw the film again I really loved the dramatic impact of the scene. It is a confrontation scene between my father and Sunil Dutt. I quite like the way my father delivers his dialogue with gritted teeth telling Jarnail Singh how he wants to see him hang to death and suffer while he dies. 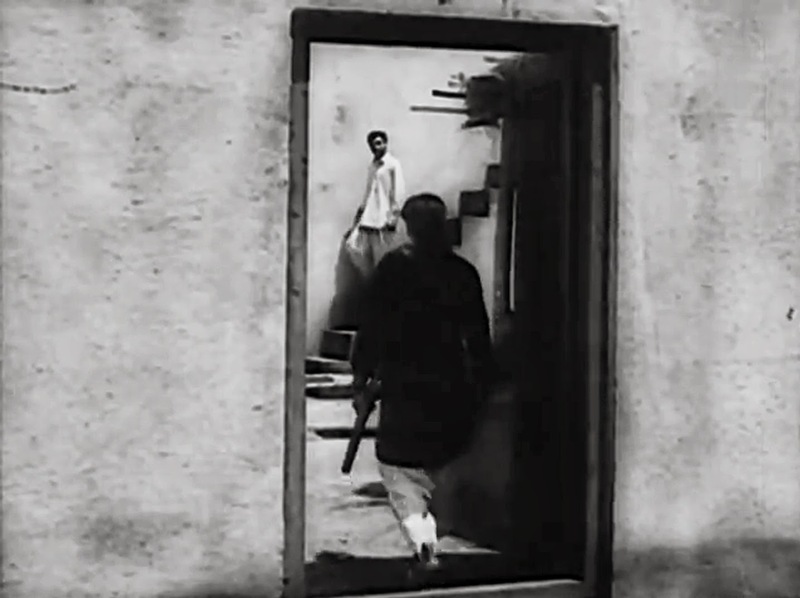 The scene begins with both Jarnail Singh and the SP approaching each other. The camera angles, the background music, in fact the way the scene has been picturized, it creates a wonderful impact particularly on the big screen. The police had specifically come to the village to protect a rich man (Gautam Mukherjee). But they are caught unawares as they see Jarnail Singh holding the rich man at gun point. Jarnail Singh also warns the police to lay down their arms as his men are right behind the police. The SP realizing that innocent villagers can get caught in the crossfire, decides to back down but insists that Jarnail Singh meet him before leaving the place. I have some screen caps here of the scene. 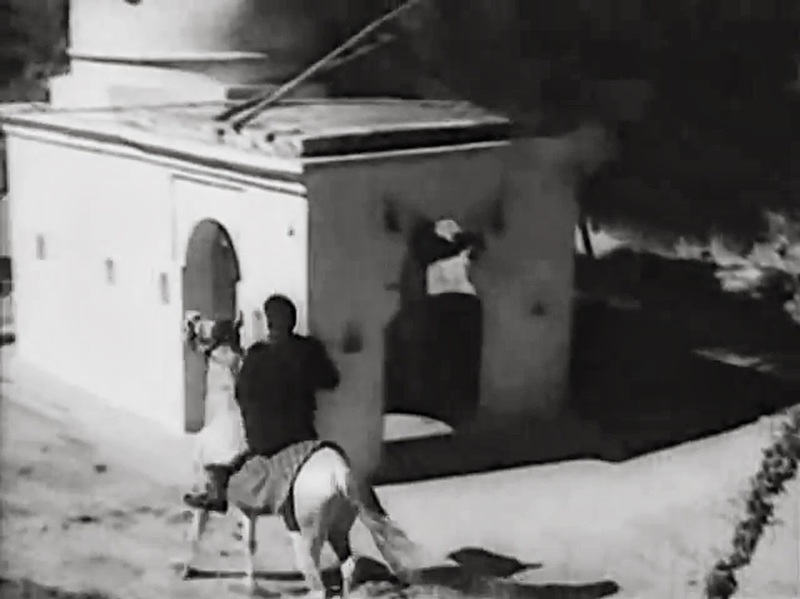 Another sequence which I really like is the one where the dacoits disguise as villagers (above) and manage to evade the watchful eye of the police. 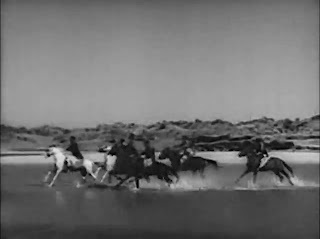 The background music has been used sparingly, after the initial dramatic music, you later hear just the tinkling of bells hanging around the necks of the cattle. Before they join up with the villagers you see the dacoits stealthily making their way (above). 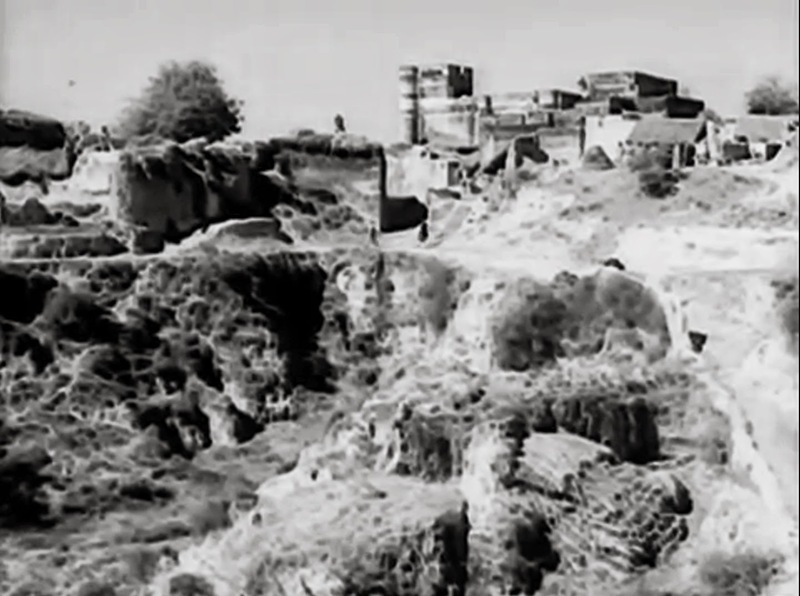 As the camera follows the dacoits you see the entire expanse of the Chambal valley. The photography by a lesser known cinematographer A. Bhattacharya was excellent. Incidentally I still remember this gentleman, he was quite an endearing person. When a film is shot on a location which is unusual and the director is able to exploit the location then it only enhances the cinematic appeal. MJD has several such scenes, one more scene which I would like to point out is the chase sequence between the villain Kripal Singh (Siddhu) and Chameli Bai (Waheeda Rehman) shot in the ravines. In the screen shot below you can see Chameli Bai running in the ravines desperately trying to escape from the clutches of her tormentor. At the time the film was shot in the Chambal valley the place was teeming with dacoits, they had to shoot with the help of police protection. One of the members of the police team accompanying the unit was a former dacoit. I do not remember in what capacity he was working with the police but what I do remember was my father telling us about the stories this former dacoit used to narrate. 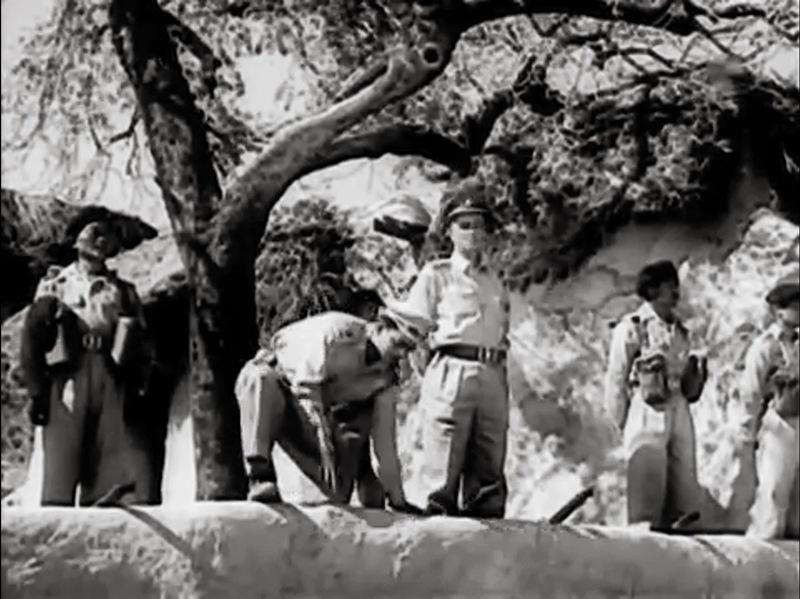 Some of these stories had been incorporated in the film, for instance there is a scene (see below) where Rajindranath escapes from the clutches of Jarnail Singh’s rival Kripal Singh by asking him for a beedi, this is what this former dacoit had experienced. goes that this temple was built by real life dacoit Man Singh and that every year he used to put up a bell at this temple. There is a scene where my father is shown to be shooting at a closed door. He was using a real gun, it is called a Tommy gun, a kind of light machine gun, the bullets too were real. The need for using a real gun arose because they wanted to show the bullet holes. Nowadays thanks to technical advances there is no need to use a real gun. Those of you who have read the guest posts that I did on my father will remember that I had mentioned how fond he was of little kids (Tarun Bose - The Soft-Hearted Villain). Obviously therefore he couldn't bear to hurt any children. Now it so happened in MJD there was a scene where little Shahid playing Jarnail Singh's son rushes to the SP crying and begging him to spare his father's life (see below). According to what I had heard from my mother was that my father used to say that little Shahid was quite adept at doing the crying scenes. 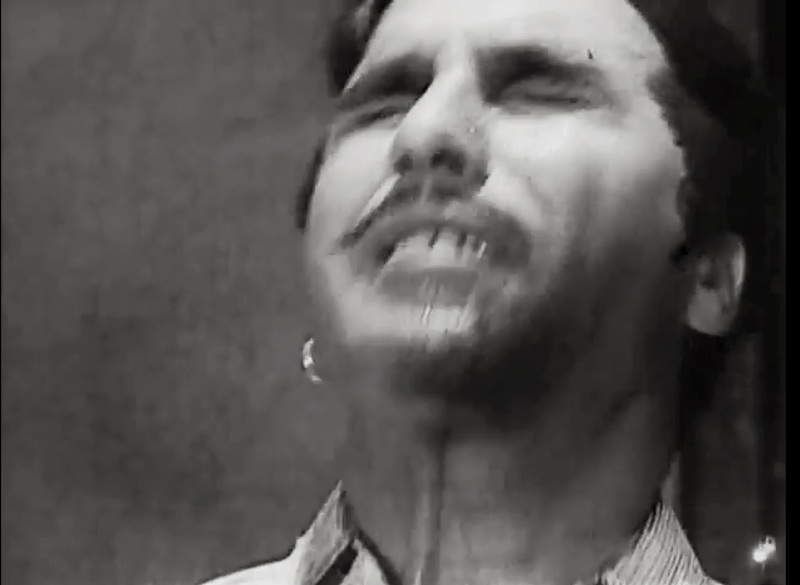 The director just had to ask him to cry and he would perform like a true actor sobbing bitterly so much so that my father used to say, "I feel bad when he starts crying like that". Note my father's expression below as he holds Shahid, it was definitely not difficult for him to give that expression of concern and sympathy. The unit particularly the male members had to rough it out on location. There were no fancy hotels here, however Swiss tents with all the facilities were arranged which proved to be a boon particularly for the ladies. 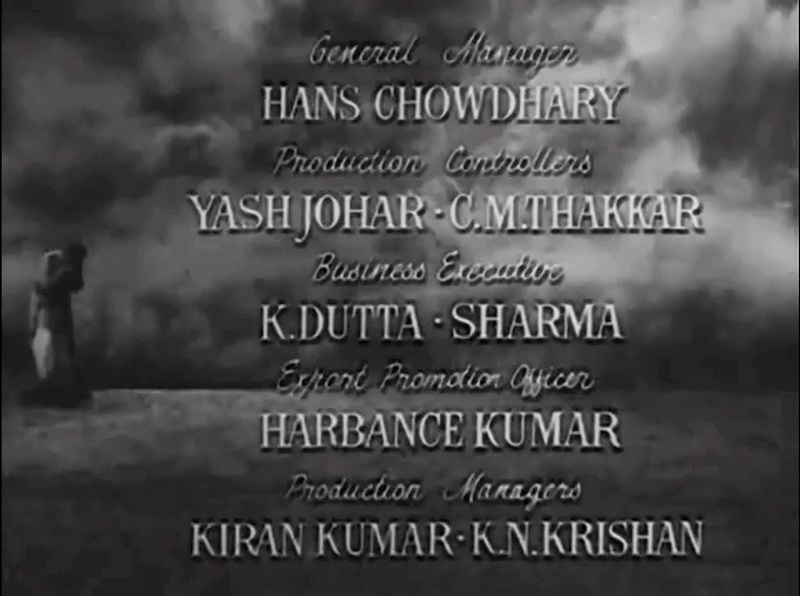 While watching the film again I noticed something interesting, I found Yash Johar's (Karan Johar's father) name in flm's credits. He was the film's production controller. 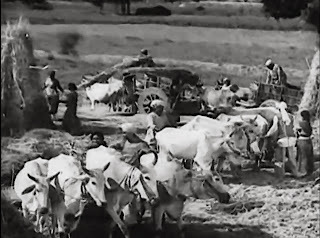 Dacoits had once come and silently seen the film's shooting. 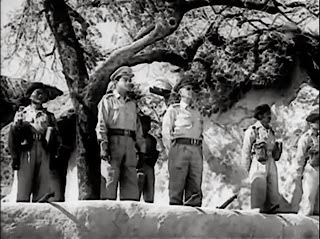 The villagers who used to hang around to watch the shooting informed the film’s unit about the dacoits' visit only after the dacoits left. Given the proximity to the dacoits my mum obviously was spending sleepless nights. Unlike today, everybody did not have a phone then, you had to apply for a telephone and patiently wait for years till you got a connection, we were among the many who did not have a telephone. Since they were shooting deep in the valley, writing a letter was out of the question which meant my mother received no news, I was a kid so was oblivious to my mum’s worries She even shared her worry with one of her close friends Mrs Talat Mehmood , incidentally they (Talat Mehmood lived in the neighbouring building). 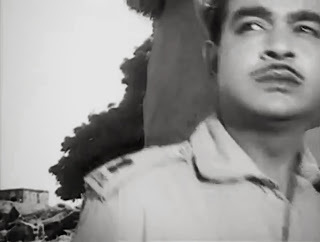 After spending days worrying, when my father finally came home, my mother broke down, my father was confused, he had sent a message through Mrs Nargis Dutt. It so happened that Nargis had gone to the location, my father knowing that mum would be worrying requested her to pass on the message to my mother that he was fine. My mother had received no such message. Later that evening Mrs Talat Mahemood came over and my mother expressed her disappointment at Mrs Dutt’s ‘irresponsible' behaviour. Mrs Mehmood agreed with my mother and went back home. Later that night we were surprised to find Mrs Mehmood once again at our doorstep, but this time she was accompanied by her husband. I was small but I still remember that night I was surprised to see them visiting us at that late hour. They were actually going to a party, but before going to the party Mrs Mehmood insisted that Talat Uncle apologise to my parents. What happened was that Nargis was aware of the fact that Talat Mehmood was our neighbour, so she called up Talat Uncle requested him to pass on dad's message to mum. Talat Uncle agreed to do so but later forgot about it, when his wife told him about how Nargis had not bothered to pass on dad’s message, his memory was jolted and his reaction was,”No! No! she did tell me I completely forgot about it”. I still remember Talat Uncle’s- (the perfect gentleman)- embarrassed look, he was blushing, of course after all the misunderstandings were cleared up everybody had a good laugh, poor Mrs Dutt got the blame for no reason. This is one incident I will always remember. You can see the film on You Tube, You will find the scenes that I have discussed above in the links below. Finally you see below the silver jubilee trophy of MJD. 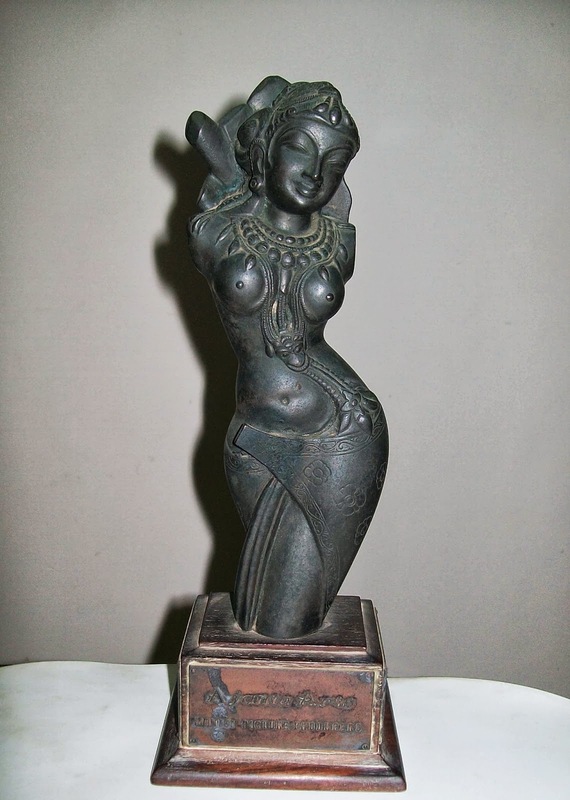 Silver Jubilee trophies usually were quite over the top, I like this trophy the most, it has an aesthetic appeal. I wish there was some kind of film musuem, I would have donated this trophy to the musuem considering that a film's silver jubilee is a thing of the past. My next post will be about another of my father's memorable but long forgotten film 'Oonche Log. I loved the way you have described each scene so nicely,I always enjoy reading the interesting incidents that you provide us.I haven't seen this movie but I think I must watch it as soon as possible. P.S- I loved that silver jubilee trophy. Thanks Shreya and yes you must see the film while You Tube still has it. Lovely incident taht with Talat mehmood and the forgotten message. The whole post was very riveting! You are welcome Harvey,glad you enjoyed the post.The incident about the forgotten message, I do not think I will ever forget it. Fascinating, Shilpi. 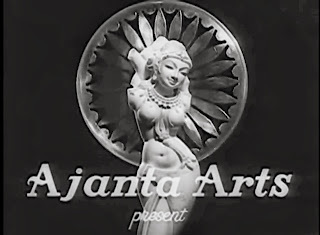 You know, this is wasted on a blog (though I must confess to eagerly looking forward to each post as and when you write them) - like the Ajanta art figurine, this is a long and very interesting journey into the lost art of film-making under such conditions. Your anecdotes of your father and his peers, the little personal incidents that colour each post - why, this is a pure goldmine. Oh, do get a couple of your blogposts to some publisher or agent and see if they are interested...! It would be a shame if a larger reading public cannot read these tales. I'm sure there are plenty of old film (and film-making) fans who would be delighted to read this. What a gem of a comment Anu, you made my day. Like all writers I too would love to take my work to more people, but I am realistic, I know I will be snubbed by publishers. In fact when I was doing the guest posts for Memsaabstory, I remember Madhu suggested I approach her publisher, she even provided me their contact details, well when I did contact them, it wasn't a pleasant experience. Publishers will unhesitatingly publish umpteen badly written books about the usual celebrities but give them something off the beaten track and they will reject it. Anyway I am happy with the few readers who appreciate my writing here, besides it is so liberating, there is no editor looking over my shoulder. Of all the films you've reviewed so far, Shilpi, this is the only one I haven't seen - yet, this is perhaps the one which resonates the most with me. Because my father was an SP in Bhopal (and later, after he was promoted, an AIG in Gwalior) - and the Chambal area was all part of his jurisdiction. 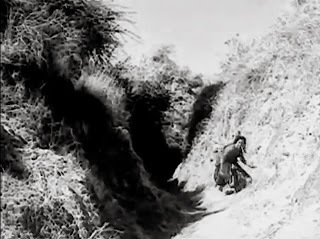 He would go off, sometimes for days on end, on the trail of dacoits, and (since there were no telephones where he would go - deep in the ravines), we had no way of knowing where he was, or when he was coming back. Or even IF he was coming back - encounters could be very unpredictable. Even though I was quite small then, I still remember how worried my mother used to be. That is, perhaps, the one reason I am not fond of daaku films to this day - I find them too distressing. Madhu I can relate to your and your mother's fear, I do know my mum did spend some sleepless nights back then. I think however you can make an exception and see the film, it is worth it. By the way would your father know about this Quinn. I'll probably speak to my father today sometime. Will certainly ask him about Quinn. By the way, I just remembered something I meant to mention yesterday. You've written that amongst the policemen who accompanied the crew, there was a former dacoit. When I was reading your post, the first thing that came to my mind was, "Ah, police informer." I remember my father telling us about dacoits who would turn informers. Occasionally, my father would get phone calls even at home, late at night, passing on a message from an informer about how so-and-so dacoit was holed up in so-and-so place. Madhu, in my post I refrained from using the words police informer because I was not sure about the technicalities, so maybe you can guide me on this.I was under the impression that reformed criminals inform the police on the sly and do not openly work with the police as this former dacoit was doing. So I guess I was wrong, wasn't I? Anyway, returning to Mr Quinn. I asked my father, and he confirmed it. The man in question was a Mr Terence Quinn. In fact, my father trained under him for a while at the Central School of Weapons and Tactics (Indore). Later, Quinn moved to the BSF, and was posted in Manipur. In 1970, my father was also posted to Manipur, and he and Quinn worked together on police operations to counter the Naga insurgents. Now, isn't it a small world? We do have another connection. Your father trained under Quinn and my father's character in the film was based on him, what a coincidence! Actually when my brother told me about Quinn, I did a Google search on him and drew a blank, so please convey my thanks to your father for this information. Yes you are so right Madhu. Now, this exchange was interesting!!!! Thank you Madhu and Shilpi! Yes, Harvey life is full of coincidences. 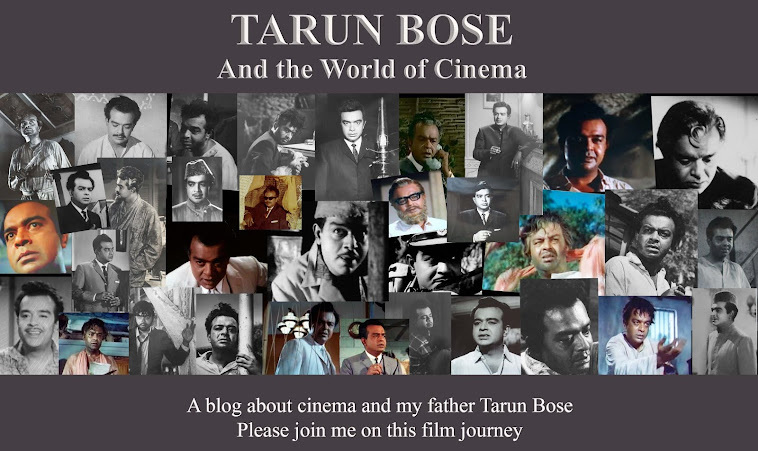 Even before we came to know of Tarun Bose so closely(through this blog), I do rember his performance in Mujhe Jeene Do (among many of his other performances, of course). His personification of a humane but rules-following police officer should remain the top quartile of excellently enacted police roles on Indian cinema. Jiadev's music was certainly a very high point of the film. Raat Bhi Hai Bhhegi Bheegi, Chnad Bhi Hai Madhdham Madhham- Lata Mangeshkar - http://youtu.be/ORzmfJjPTPQ - remains not only landmark song , for either Lata or Jaidev or Sahir, but also one of the most remarkable performances of Waheeda Rehman. Thanks and yes you are absolutely right about the songs. I wanted to touch upon the songs too in my post but, as it was getting too long I dropped the idea. Thank you for this entertaining and informative post, Shilpi. I have not seen the film, but I did translate the songs for Tom, and was struck at the amazing camera angles. 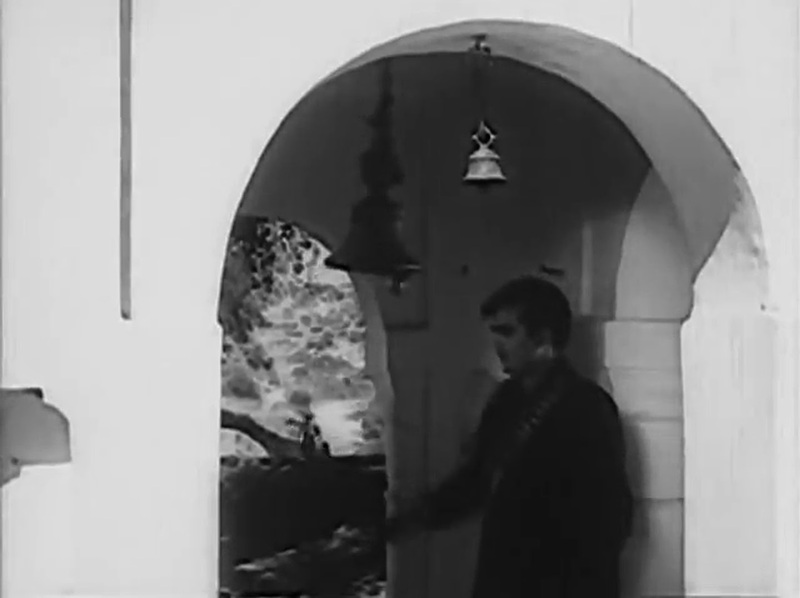 Tere bachpan ko was rendered even more poignant by the excellent expressions of Waheeda and Sunil Dutt as well. Maang me bhar le rang sakhiri is like every Indian girl's dream wedding come true. Jaidev's music is superb in this film. I have seen some clips of the last few scenes and they are heart-rending. Thanks Ava, you know I did want to discuss the songs too, but my post was getting to be too long. Maybe I should do a separate post on just some of the memorable songs from my father's films, whether he features in them or not,God willing maybe I will do that in the future. Wow! What an absolutely beautiful post this is, Shilpi! Even by the highly absorbing standards of your posts, this one is right up there!!! Just loved reading every word of it, and taking in every still. But the way you describe it, discussing minute details of camera positions et al, makes it so much more insightful! And your anecdotes!!! Always SO much fun to read. Thank you very,very much Raja. I am really glad you enjoyed it. I think the links that I have given too are from Edu Prod. MJD. That is some good work all of you are doing for Edu Prod. Hope you enjoy my next post as well. I've seen the film a couple of times. What I do remember is that scene you've described so well - their confrontation scene. I agree wholeheartedly with you about the magic of filming. The various camera angles really added to make it stick in ones memory. Both the dacoit and SP were so well matched in their grimness. I love this film. Sunil Dutt looks very handsome and Waheeda so beautiful. The film was no ordinary one. Enjoyed reading the exchange between you and Madhu. So many interesting anecdotes. You're doing an excellent job of writing down the meories of your father's and his films. Thank you so much for it. Your style of writing is so reader friendly. Thank you very much Pacifist, I am real glad that all of you are enjoying this blog so much.